Olabisi Onabanjo University, Ago-Iwoye, Ogun State [OOU] Post-UTME Admission Screening Form, Eligibility, Screening Date, Time and Venue, and Application Guidelines for NUC Newly Approved Programmes for 2018/2019 Academic Session. 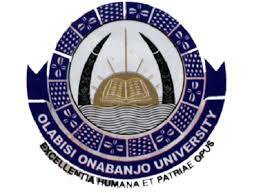 In view of the above, interested candidates who must have applied to the Olabisi Onabanjo University as first choice candidates on or before 6th August, 2018 and scored above 180 in the 2018/2019 Universities Matriculation Examinations (UME)are eligible to apply. The Olabisi Onabanjo University, Ago-Iwoye, Ogun State will conduct a Post-UTME (PUTME) Screening for candidates who wish to be admitted into the University for 2018/2019 Academic year. The screening shall be conducted from Monday 30th July to Friday 3rd August 2018. Online Registration Commences on Wednesday, 4th July 2018.
Business Administration, Industrial Relations & Personnel Management and Public Administration. (Wednesday 4th July 2018 - Friday 27th July 2018).